Catcher Tony Gilmore hit well for the Arkansas Razorbacks in 1989, helping them to an April win, according to Gilmore's hometown Tulsa World. Gilmore told The World his success built on itself. "No one has ever expected me to be much of a hitter," Gilmore told The World. "But I've got a lot of confidence at the plate right now." Gilmore used that confidence to help Arkansas that year to the College World Series. He later used it to make the pros. His run, however, ended short of the majors. He briefly made AAA, but not the bigs. 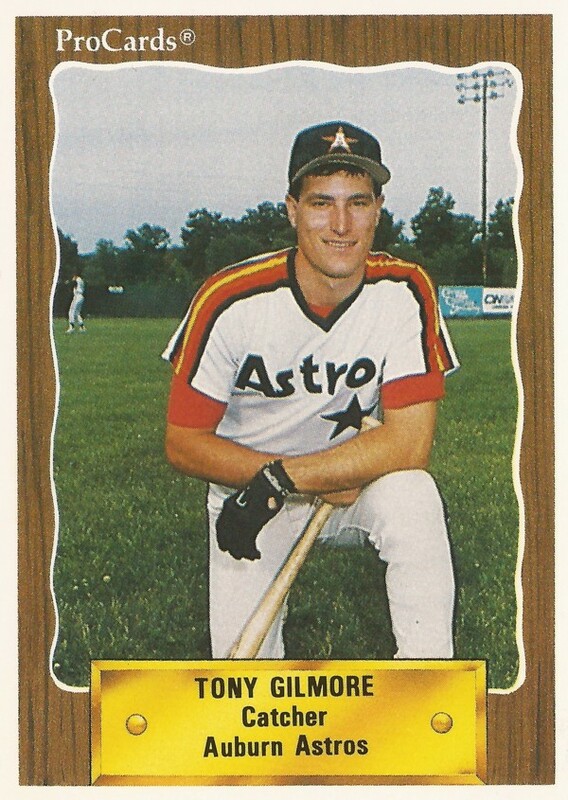 Gilmore's pro career began in 1990, taken by the Astros in the eighth round of the draft out of Arkansas. At Arkansas, Gilmore hit .310 his junior year, then .272 his senior campaign. He made the all-conference team in 1990. He doubled in the go-ahead run in a 1989 College World Series win. He hit the double after having trouble earlier, according to The Omaha World Herald. "In batting practice," Gilmore told The World Herald afterward, "I wasn't touching a thing." Gilmore started his pro career at short-season Auburn. He hit .217 over 33 games. He then moved to single-A Burlington, improving his average to .272. He made the league all-star team led the league catchers in fielding percentage. Gilmore made high-A Osceola for 1992. His average dropped to .207. He then played at AA Jackson for 1993. He saw just 47 games and hit .172. In 1994, Gilmore made AAA Tucson for two games, then played the rest of the year at Jackson. Overall, he hit .251. His final pro time came in 1995 back at Jackson. He hit .212 there over 53 games, ending his career. Gilmore has since returned home to Oklahoma, where he serves in 2016 as a middle school principal and athletic director.